Don't let the title mislead you, my kids are taught to be kind to others I just don't teach them to treat adults differently. I don't believe that adults demand respect just for being adults. 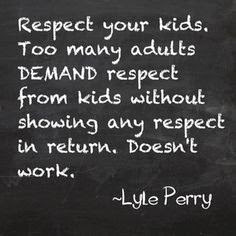 Some adults treat kids poorly and I have never wanted my kids to feel that they have to obey another persons requests simply because they are older or knuckle under and say "yes, Sir" or "no, sir" when inside they are gnashing their teeth. 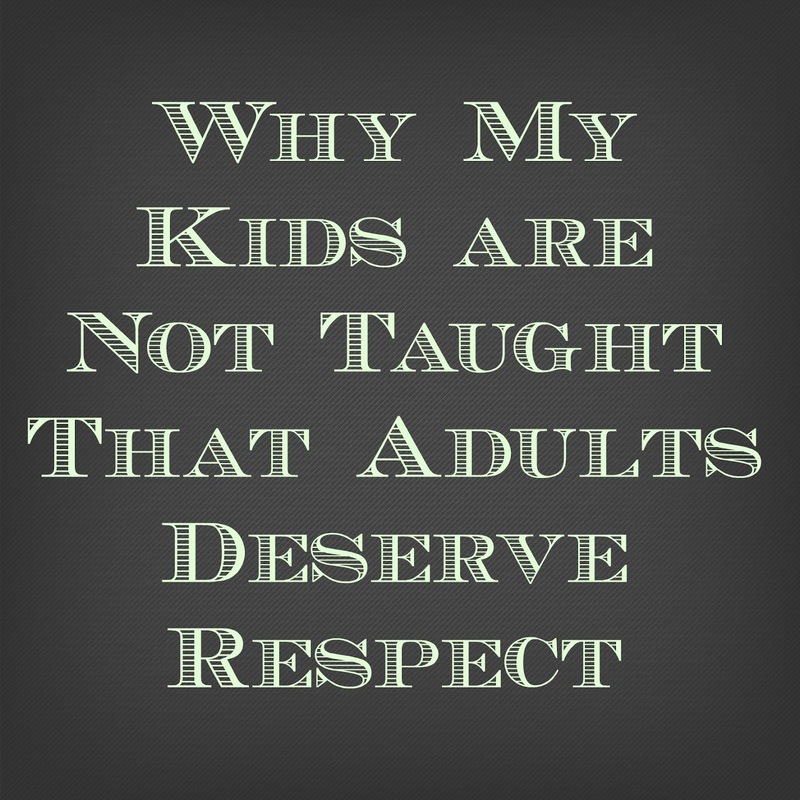 When respect is defined as a feeling of deep admiration for someone or something elicited by their abilities, qualities, or achievements, I find it laughable that we as a society have decided that all adults deserve and demand respect. My kids don't have to admire every adult nor do they know most adults well enough to know what admirable traits they may possess. I think that respect must be earned. I do, however, believe that all people deserve to be treated the way we would like to be treated. I have taught my kids to be aware of those around them and treat them with kindness. They open doors for younger children and adults alike. They smile and answer questions politely and we work constantly on saying nothing if you have nothing nice to say. I have watched my boys give up seats on a bus to a variety of tired looking passengers and have watched them help people pick up papers or candy they've dropped on the ground. They are caring, sweet boys most of the time and I think that is more than enough. This post started percolating in my head when I stumbled upon this blog about 6 Things My Kids Are Not Allowed to Say Adults. For some reason I just could not get it out of my head. I was glad to see that the author modified or clarified some of her views because I too thought she inadvertently was leaving her children open to predators (but giving her the benefit of the doubt I assumed she had a way of dealing with that topic with her kids). However I still took objection to a lot of what she was saying and was glad that I was not one of her children. I guess, I ultimately had a problem with the demand that kids just blindly obey without talking back and without any say so. My kids have feelings, views and beliefs and I don't believe that they aren't important just because they're young. While I don't love it when they talk back they know the difference between showing me their point of view and really talking back rudely. I don't tolerate rudeness but I do encourage them to explain things to me. For example: If I ask them to come set the table or to clean up their toys they are more than welcome to say "Can I finish this (insert project they're working on) first?" If I need the job done right away I can let them know I don't have time to wait or I can listen to them and see they need a bit more time and give them that extra time. They have, occasionally, said "wait a minute" but they will usually clarify that with why. For example "wait a minute; I just have to go to the bathroom first." There are no phrases that my kids can't say (within reason-- I don't allow them to curse and swear) but I want them to know that I am here to listen to them, to help them, and to work together with them. I can't expect them to show respect for others if they're never shown respect. You are raising great humans! Job well done. Thank you! I sure am trying. I hadn't thought of it in that perspective but I bet that is a big part of it! Great post, I absolutely agree with you. Love that last quote!